truly need expert inspection and repair. Don’t ignore the largest moving part in your home. You would never skimp on getting your vehicle inspected or put off safety repairs, which is why we offer our deal of the month specials. Contact Ken Davidson Garage Doors for a free safety inspection today and protect your property and family from any risk of harm due to garage door malfunction. doors and can work with you to select the perfect garage door to accent your home’s exterior. For DIY aficionados, we provide a broad selection of garage door parts. Whatever your need—whether garage door repair in South El Monte, a new door, or parts Ken Davidson Garage Doors is your #1 resource. At Ken Davidson Garage Doors, we can repair both single and double garage doors. We have complete knowledge of every type of garage door repair from minor hardware upgrades to complete door replacements. In addition, we have a portfolio of automatic garage door openers available and can provide professional installation, often in less than one day. That means you can have a convenient automatic door opener right away. We also have the expertise to repair automatic garage door openers. Whether you prefer the durability of fiberglass, the strength of steel, or the elegance of natural, rich wood, you’ll find the perfect garage door for you with all the little details you won’t find anywhere else. C.H.I.’s collection of carriage style doors are built with the highest quality materials, resulting in an exceptional line of traditional doors. Want to replicate the timeless look of carriage style doors? Design and strength join forces to carefully craft our stamped carriage house doors. These carriage style doors are embossed with a wood grain finish and shaped from steel. Ken Davidson Garage Doors hosts a complete selection of safety and performance-tested commercial and industrial overhead doors, including our rolling-steel garage doors. To meet your business needs, we host a wide array of styles, from internal and external to high performance, fire rated, and sectional-sealed doors. Backed by a dedicated, nationwide network of Distributors and engineered for excellence, Ken Davidson Garage Door’s industrial and commercial doors are the #1 choice for serviceability, durability, and hassle-free performance. Whatever your requirements, we have all kinds of overhead doors to suit the needs of your business. Please click the commercial category you are interested below for more information. The warmth and natural beauty of wood gives any home or garage a greater sophistication and appeal. You can achieve the look you have always wanted with smooth, well-polished accents & wood grain finishes. You will see attention to detail when you closely examine the fine craftsmanship that separates traditional garage doors from accented ones. These doors do not need to be treated against moisture damage or the sun, unlike natural wood. Accents are only available in both in long/short stamp configurations. Both feature an insulated core for protection against the elements and long lasting steel construction. If you want to make a more stylish statement with your home, you can find the perfect accents here. Its unique shade gives a wonderfully rustic yet elegant presence. An appealing decision for a wide mixture of home styles. Rich, deep, and exquisite, this look says you’ve arrived. A simple way to stir up the envy among other garage doors on your block. From extreme durability and thermal efficiency, to architecturally inspired models, explore our extensive line of commercial sectional garage doors. Find the right sectional garage door to provide both functionality and aesthetic appeal to your business. Whatever your requirements, we have all kinds of garage doors to suit the needs of your residence or business. For top of the line functionality, efficiency and durability in a garage door opener, look no further than Liftmasters. The selection of quality Liftmaster garage door openers ensure that you will be able to find the perfect opener with the right options for you and your home or business. From traditional openers and remotes to openers that can be activated via you smartphone, Liftmasters will have the right garage door opener for you! 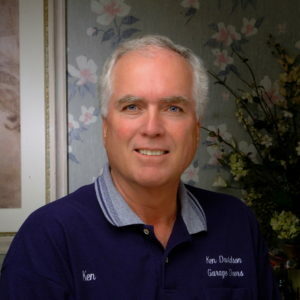 Ken Davidson Garage Doors is a family owned and operated business. We have been providing garage door and opener repair-installation for over 10 years to home owners. We are prepared to handle most of your garage door or opener repairs during the initial visit. Residential garage door and opener repair and installation is my only business. I am focused on offering the best products and services at competitive prices for garage door services. Your garage door should be an asset to your home. To maintain it’s proper operation we use only the best hardware available for your Garage Door Repair. Repairing your garage door is my main focus. Whether you need springs, pulley, cables, rollers, opener parts or adjustments. My qualified technician will be able to service your needs today. My service vehicles are fully equipped with replacement parts and supplies so you can expect all repairs to be completed during the initial service call. We also provide you with a 10 point safety evaluation, educating you on the overall condition of your garage door hardware and opener. Your satisfaction is my personal concern. New Door and Opener installation are also available. Ken Davidson Garage Doors provides around the clock repair services in for emergency needs with your garage. We are here for you 7 days a week to solve your garage problems in. Our company can repair, fix and install all types of residential garage door openers and manufacturers. Our garage door service continuously provides full residential garage services for homes of all sizes to meet your garage door installation and or repair needs as well as routine garage door maintenance for both automatic and manual garage doors. Please call us immediately, if you are experiencing any problems with your garage door, small or large. Our garage door repair service rates are the most reasonably priced in your local area, as we know what the competitors charge and we have lowered our prices because we know what it actually costs for garage door repair services and we want to be truthful with you and your family. Remember you get general maintenance for your automobile, so why not for your garage; call Ken Davidson Garage Doors for all of your garage door repair requests. We fix all major brands and garage door openers.We can help you with your garage door repair needs. Thanks to Ken Davidson for helping me over the phone with my garage door. It was an easy fix but I did not know that – thank goodness Ken did! I really appreciate his willingness to diagnose the problem (the sensors) and his friendly advice. It saved me a service call. Definitely would recommend him. I had two different houses that needed garage door repairs and your company came to my rescue to fix them both; not only did you fix them, but you completed the job the very day I called. Now that is what I call fantastic customer service. You have just gained a loyal customer for life. I found your number on the garage door (the previous owners must have used your company to install it) so I decided to call when the spring on the door broke. Your tech guy, Jay, was at my house the next day and knew exactly what to do to get the garage working again. It was as easy as one, two, three great work at a good price; I couldn’t be happier. Thanks again. I wanted to express my appreciation for fixing my garage door so promptly this weekend. A friend of mine referred your company to me and I couldn’t be happier with the service I received. Why not call the best garage repair? Contact Us! We believe in educating the customer before helping them make an informed decision on any repair or maintenance job. When you call, you will likely get a live voice on the phone, and a knowledgeable one at that. In addition to offering top quality products at reasonable prices, we maintain the highest level of service for all of our customers. Unlike some garage repair companies, we are in no hurry to send a “Tech” to your home and charge you for the visit. Before scheduling an appointment, we will ask you to describe your problem, and give a FREE estimate over the phone including what work will need to be done and the costs associated with the repair, based upon our extensive experience and expertise. We can work on nearly every kind of garage door, but focus mainly on garage doors that were installed in the past 20 years. Is it a broken spring? Click here to learn more. If you have a broken garage door spring, or other issue effecting your garage door’s performance, don’t hesitate to contact Ken Davidson Garage Doors for competitive prices and reliable, guaranteed service. We are Minnesota’s Garage Door Replacement Specialists. When it’s time to replace your garage door, there are several options to consider. If you have a tuck-under garage (meaning there is living space above your garage) you need an insulated door to keep your home as energy efficient as possible. If you are a homeowner in an association you may have just a few selections to choose from. If your house has a unique design or siding, you’re going to want a door that compliments the rest of your external decor. We can talk you through all of your options around buying a new garage door. From color to material, to whether or not you need new rails or a new opener. So many companies are quick to suggest unnecessary upgrades to try to run up your bill. All doors have a window option available! Come to us, Ken Davidson Garage Doors will get you going again when it’s time to replace your garage door or springs. We know there’s a lot of options to consider in door styles and pricing, but consider this–we’ll talk you through each step of the buying and installing process without running up your bill. When the time comes to replace your garage door, there are several details to consider. For example, is your garage door energy efficient? Does it complement the rest of the external decor of your house? Maybe the garage door tracks are rusting. Whatever it may be, as far as garage door repair goes, Ken Davidson Garage Doors will evaluate your situation and suggest the best options in terms of service and price for you. Garage door opener closing you off? If you have a faulty garage door opener, we can fix it fast. Offering the full line of Chamberlain Liftmaster garage door openers, we supply both the traditional chain drive as well as the quieter belt drive models. Think it’s just the opener? Think again. If you keep pressing the garage door opener button to no avail, consider the shape your garage door springs are in. They do most of the heavy lifting anyways, so if you’re door isn’t opening fully, making loud noises or is over 5 years old, you may need a garage door spring repair. Time for service or replacement? Want to understand your options? You’ve come to the right place. The Garage Door Guy has been servicing customers in the the Bloomington / Richfield area and throughout Minnesota for years. We believe in making sure that our customers understand the problem with their garage door, their options, and the costs associated with fixing them before we get to work. We are happy to take your call and are not in a hurry to send out a technician if we can diagnose and help you fix your problem over the phone. We are the Broken Spring Specialists and offer a lifetime spring warranty on the garage door springs that we install. If it’s broken on a garage door or garage door opener, we will fix it quickly and cost effectively. Having trouble with your garage door? Time to look at a new opener, door or both? You’ve come to the right place. Ken Davidson Garage Doors has been servicing customers in the the north suburbs ) and throughout Minnesota for years. We believe in making sure that our customers understand the problem with their garage door, their options, and the costs associated with fixing them before we get to work. We are happy to take your call and are not in a hurry to send out a service technician if we can identify and help you correct your problem over the phone. We are the Broken Spring Specialists and offer a lifetime spring warranty on the garage door springs that we install. If you’re having a problem with a garage door or garage door opener, we will fix it quickly and cost effectively. Ken Davidson Garage Doors services the area in Broken Garage Door Springs, Garage Door Replacement, Garage Door Repair, and any other issues effecting your garage door. We understand that your time is too important to waste. A Garage Door Repair Company technician can arrive at your home on-time and with a fully stocked truck. That means your garage door repair is going to be repaired right the first time AND usually on the first visit! Our technicians provide a fast response and quality service and will diagnose any issues right away & we can have your door working again quickly. Find out why other homeowners have trusted Garage Door Repair Company with the repair and maintenance of their garage doors by scheduling and appointment today! When our certified technician completes your work, you can be sure the best commercial grade parts have been selected to offer the utmost effectiveness and longevity for the price. Better parts mean your garage door repair will last longer and your system will run smoother. Garage Door Repair Company has partnered with manufacturers to obtain the highest quality garage door parts available and backed them with an industrial strength warranty. We install and repair most garage door opener makes and models! If you need a garage door opener repaired or installed call Garage Door Repair Company today. We install and repair most garage door spring makes and models! If you need a garage door spring repaired or installed call Garage Door Repair Company today.